Blue skies with B behind me. Tuesday I woke before 6am, grabbed my breakfast and coffee to go, and packed up my suitcases into the truck and headed over to Hannah's. I drove up to the back lot where I had parked my trailer, and Ed greeted me and helped me hook up. Then down to the circle drive in front of the Main Gait stable, and I walked into the barn to get Bourbon ready for the trip home too. Hannah's groom helped me get Bourbon out of his stall, and he wrapped his legs for me. He is a true pro, and I have to say, I've picked up more than one tip on readying a horse from him while I've been there this year. Here again, I marveled at how he wrapped the legs in the cotton pads and then bound them with the blue wraps I had provided him. They were perfect.... And in moments B was ready for the trailer. I walked him out, and I teared up. Really? :) I am so sad to leave this place today. Its been so much fun. I've learned so much. I've met more new people. And, Bourbon has come so far. Hannah has been so good to both of us - she is totally amazing.....and has given us gifts that we'll never be able to repay. But we'll be back soon. And I can't wait to find out how next year will unfold for us when we come back. 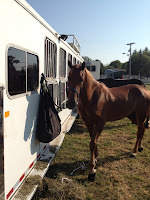 Bourbon walks to the trailer, puts one foot into the bed and stops and steps back out. He looks back, and then at me. I tug the lead rope and ask him to step in. And after a moment, he jumps right in. Maybe he was having a moment as well. :) I hook him up, pat him, and we're off. I wave to Ed as I leave, and he waves back. And as I turn right out of the drive, I look over at the Hannah Pulvers sign and smile. Bye for now. We'll be back. 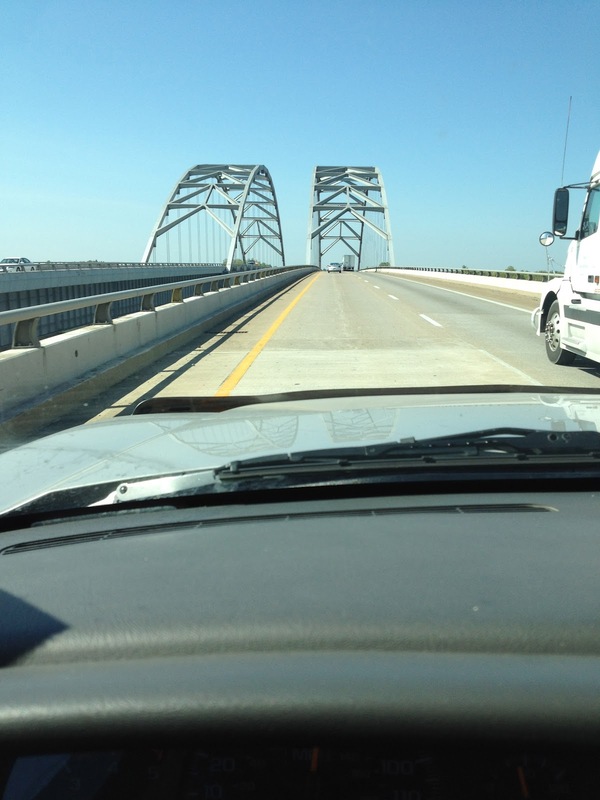 The drive is long, but fairly uneventful. I stop a few extra times, to water and check how things are going inside the trailer. 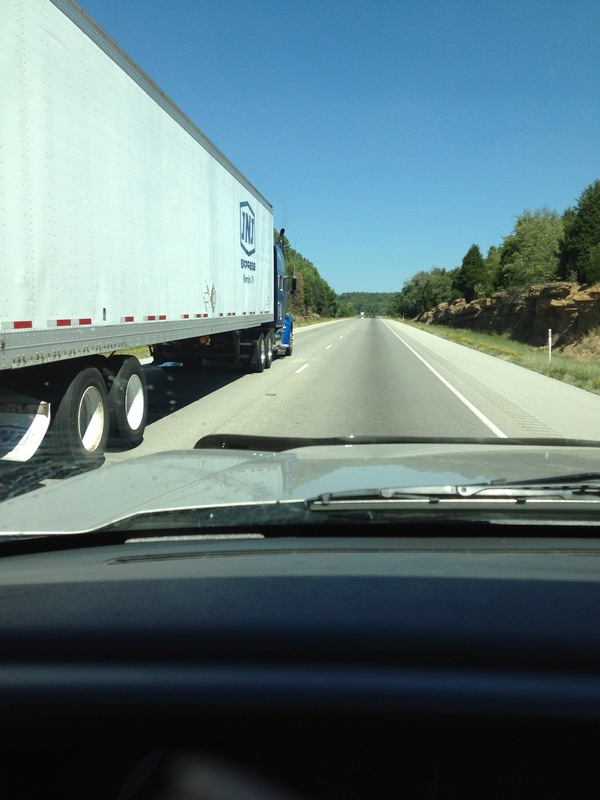 Stop for gas, stop for lunch.....and keep on truck'n. We left Hannah's around 7:30am. I arrived home about 12 hours later. Diva and Fashion ran thru the pasture to greet the truck. And then cantered all the way back to the barn with us as we pulled in. I think they knew Bourbon is back, and they are there to welcome him. 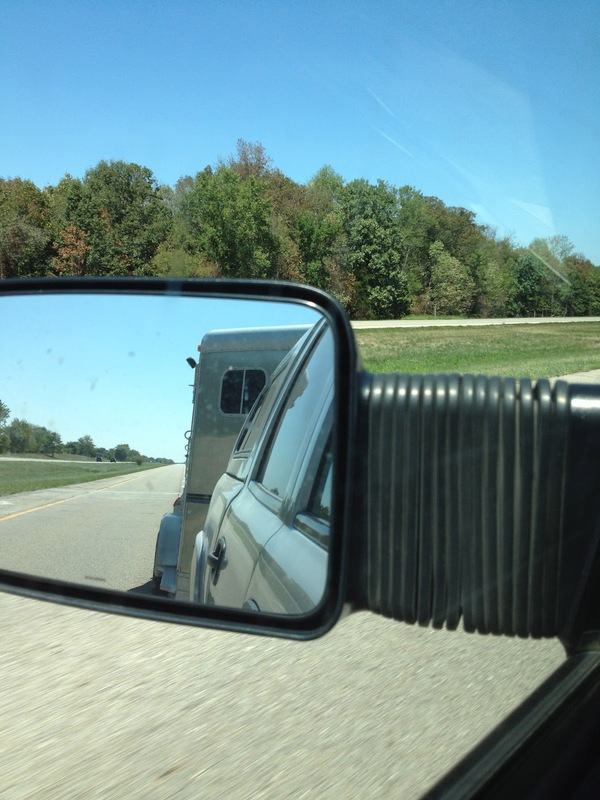 When I pulled B from the trailer, he backed out like a champ, and looked around. He craned his neck and looked at the house, the barn...and then at Fash and Diva. Then he relaxed and just strolled into the barn like he had never been gone. 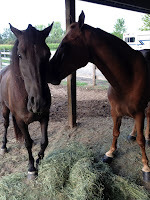 I put F & D back out into the pasture and closed the gate, and put B in the paddock right after I pull off his wraps. I think he enjoyed stretching his legs, and walked every inch of the paddock and we watched. I'm not sure if he actually recognized the place and remembered his paddock friends - but it sure seemed like that. I swear, he knew exactly where he was. It was getting dark, so I tucked him in his stall with a deep fresh layer of shavings, a pail full of cool water and some hay to keep him busy all night. Scott and I spent some time with him. Scott couldn't get over how big he had gotten, and muscled, and big, and so big. LOL. Its been a long time since he saw him in person. Probably 6+ months. And he's gotten alot bigger since last December when he left here. never gone...right back to normal. I pulled my hair back to the nap of my neck, and I pinned in my satin ribbon with the delicate lace. I like this one for my English classes - for some reason it just seems fitting. I then pinned in my clips to keep those little side whispies tamed. I then went to work on make-up. I stopped for a moment to consider...lavender or orange? Which coat would I wear? I decided to stay with lavender....and so I reached for my eye shadow in the plum shades. I curled my lashes, applied mascara, blushed my cheeks, and added a little lipstick. I looked at myself in the mirror. Boy, I'm really doing this - and I laughed, a little proud of myself. Crazy, is all I really thought. I added a little eye liner for emphasis...and then decided I was about as ready as I was gonna get. Next I donned my black show pants, my lemon yellow shirt, and pulled on my vest and tie. I rolled up my jods, pulled on socks and my Juicy Couture converse style tennis shoes. The shoes would serve me well on the walk over to the show grounds - even though they definitely looked funny with the rest of the outfit. I'd carry my riding boots and spurs, as well as my hat and show day coat. And put those items on at the very last moment...just before I went into the ring. Pat, the hostess with the most-est, at the B&B, had my coffee and breakfast ready for me when I came into the kitchen. I was up early...and so she had everything ready for me, even though her other guests would be sleeping in and served later. She's been so wonderful...and despite my stomach being nervous, I have to say the cheese omelet, bacon and fruit tasted good, and went down well. I sipped my coffee and watches a few squirrels jump from branch to branch as I finished up my meal. I scurried back to my room, grabbed my day coat, hat box and a few other necessities, and hiked my way over to the show grounds. When I arrived, things seemed calm, almost too calm. There were only a few horse trailers in the parking lot, and the HP stables only had a handful of horses with them as well. Everyone seemed more relaxed than in past days. I guess a Monday morning is a work day, and many who had showed last week, and over the weekend...maybe had headed home. I wondered how many would be in my class. Maybe it would be small? Or would others arrive later...the class was about 1/2 way thru the morning. Well...I guess that was all out of my control, so I just set about getting my jacket up to the warm-up ring, and help as I could with the horses and such. B had white ribbons in his mane, but when Hannah heard I was wearing my lavender day coat, she pulled out purple, lavender and white ribbons and had him re-braided to match. "Its your class - let's do it to match," she said with a smile. So, I indulged the double work. The warm up ring was quiet too. Just a handful of groups, and only a few horse warming up. Wow, would anyone be in my class? Well, at least a few - from Hannah's barn at least -- so I was relieved I wouldn't be alone. However, as we got closer to my class, it got a little busier. And by the time my class was called, 15 or 16 entered the ring. Yeah...a nice sized class. Whew. I waited a bit, and entered the ring in the middle of the pack. As Hannah led us up the ramp into the Calsonic, someone had climbed the staircase to the right of us. This caught Bourbon by surprise, and he shuffled a bit and did a little side stepping as he craned his neck to figure out what that was. I pulled him back, and Hannah grabbed his head-stall to calm him. Then she smiled and released me and wished me luck. LUCK? Yikes... Hope he calms after that little startle. LOL. And, he did...he got up into the ring and went right to work. As I got him up into the flat walk, and did my entry lap for the judges, I relaxed and enjoyed the ride. I was here, I was doing this, and I smiled. I literally smiled all the way around the ring. I looked up into the crowd, I saw BobbiKaye, I saw a few of my barn-mates cheering me on, I saw Hannah...and heard her encourage me. I took it all in. I actually saw the judges for the first time. I noticed all the people in the audience. They watched us pass by. And I felt B under me. I heard his hooves. I felt the slight tug on my hands by the reins as B nodded his way around the ring. It was like all my senses were heightened. And it felt good, I was having fun....and enjoying it all. We didn't trip. We didn't get behind any other horses and get all covered up. And, before I knew it, we were on the reverse, and then called into the line-up. As I chose a spot to lineup, BobbiKaye walked over and sat in front of me, and gave me the thumbs up. It was a good ride. And I felt really good. As the ribbons were called, I received 6th place out of the group of 16 on the call sheet. Yeah! Another ribbon from The Celebration. Wow! 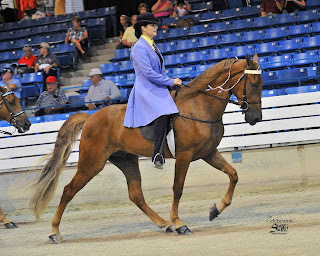 As I pulled B into a gait to collect my ribbon, he walked like a champ. Again, that bitter sweet feeling came over me. As I neared the exit gate, I knew my Celebration was also coming to an end. 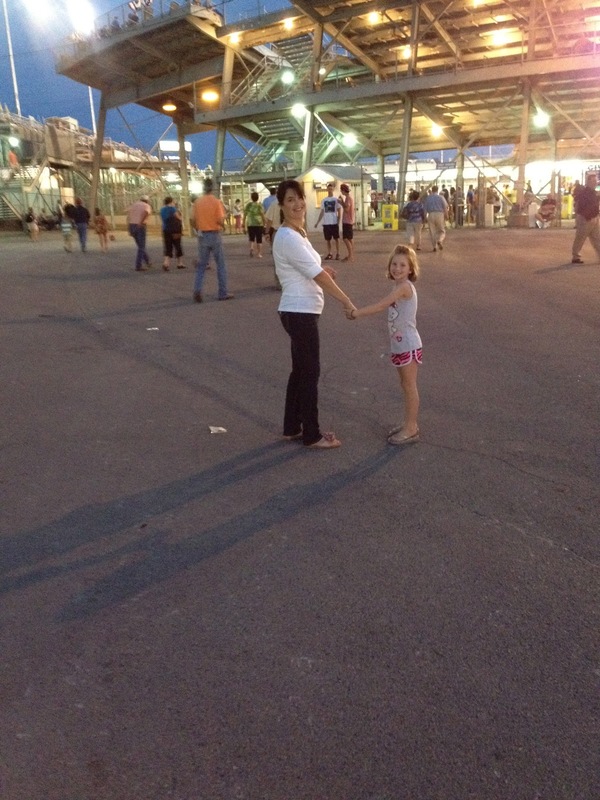 Upon exit, Hannah was there to great me. She smiled, but she also snapped her fingers with a "aww-shucks"....she had thought we did great...and wondered why the judges were so hard on him. I just thought...I'm so proud that he got a ribbon. For me, it was a huge accomplishment. No one knows me. No one knows my horse. We are unknown...and still getting ribbons at the Celebration. And, while it must feel TOTALLY AWESOME to win a blue or reserve....I am feeling pretty good about what we have accomplished. And, that I have something left to strive for in 2013. Next year B will be 4, stronger, more coordinated, and I will have more experience under my belt too. Plus Hannah will have another year on his training as well. Bourbon poses in the Winners Circle. After our class, I walked B back to the trailer. As I exited the Calsonic warm-up, I walked past the winners circle park, where all the winner photos are taken. I grabbed Van and asked if she would take a photo of me in front of the park. When we got there, there was a big white truck parked right in front of the Celebration sign. So, Van looked at me and said, you know, there is no rule that you can't go into the park and go up and take a photo in the winners circle. And we smiled at each other, and headed right in...me, Van and Bourbon. Like we were thieves in the night. No one was there except the media. I walked up with B, and he posed. I swear he knew what was up, and posed for the pictures. Van caught this great shot. B standing tall, and me with a smile of accomplishment for my three ribbon placements at the Celebration. A journey that I've been traveling since I dropped B at Hannah's on December 31st...where the new year started 8 months earlier. We giggled, and just as I stepped away, a group came up with their WC horse and the media went to work. Maybe one day that will be me. Or maybe not. But a dream.....none the less. And I smiled. 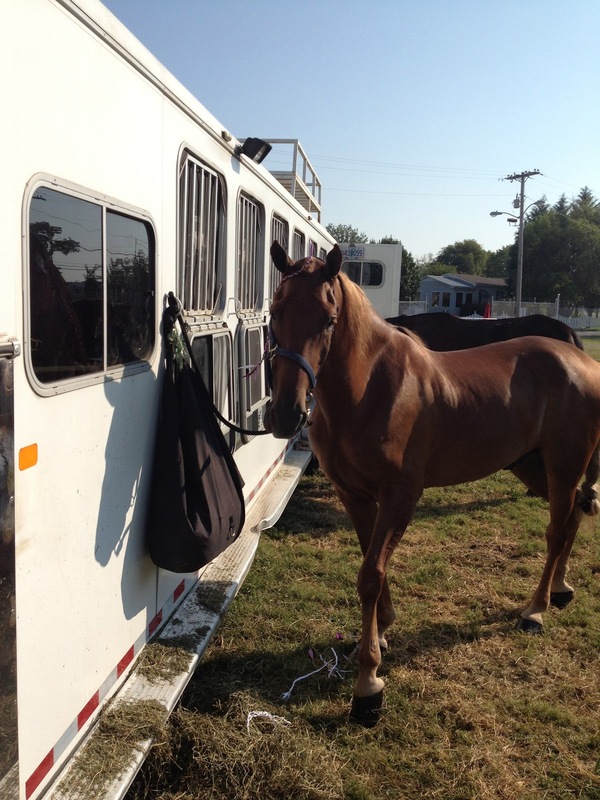 I took B back to the trailer and handed him off to get his tack removed. I helped a little, talked to the rest of the gang....and then grabbed up my day coat and hat box and headed back to my B&B as Hannah and Bub and the team readied to leave as well. The rest of the afternoon was spent organizing and packing for my ride home. 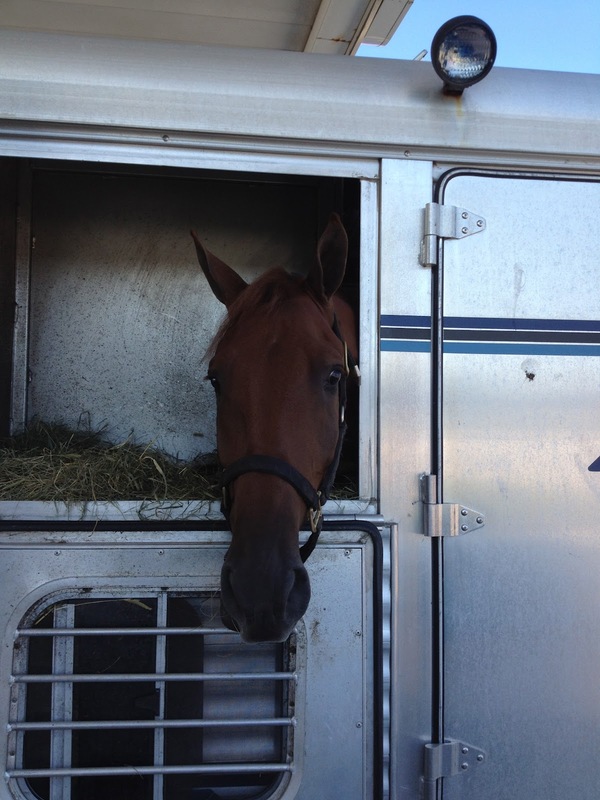 I went out to Hannah's place and made sure all of Bourbon's tack was pulled and packed in the trailer as well. I was going to have an early morning...so wanted everything set and organized, so I could arrive, hook up, load up and get rolling quickly tomorrow. I also ran back to the Calsonic to buy a Celebration shirt and hat - for a keepsake. And, stole a few moments to lay down and nap. But in no time, it was 6pm, and I had to get ready to go over to the evening show. And Jane's text message was encouraging me to get a move on for happy hour before the show. Exhausted or not, I had to get a move-on. So, as I walked back to my B&B, I thought back about the week. It was fun and a huge success. I was sad to leave, since there was so much more show to come. But I was also looking forward to getting B home for awhile. So, again that bittersweet feeling came over me, as I walked up the drive to the B&B, unlocked the door to my room and slipped between the covers. Morning would arrive soon....and I had a long drive ahead. Sweet dreams. 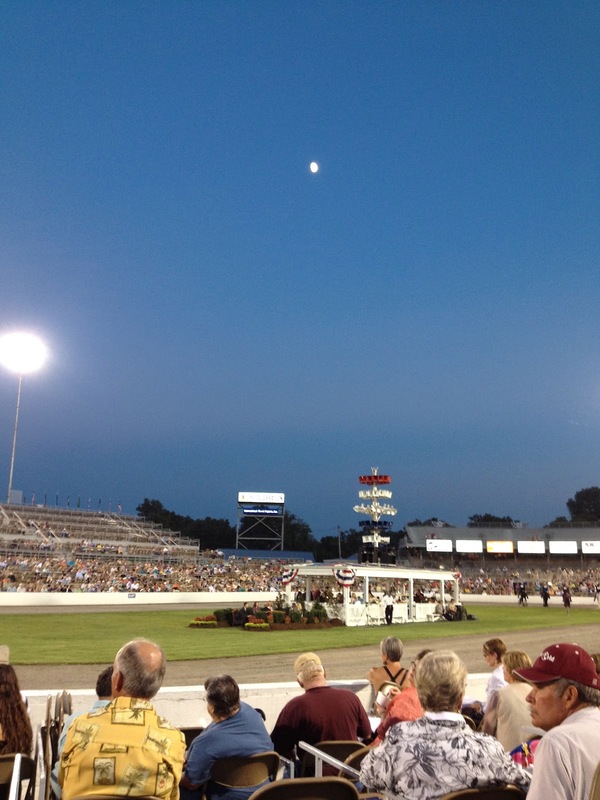 The past few days I have been getting some practice rides in, and enjoying the show for the weekend. The celebration is really quite amazing. 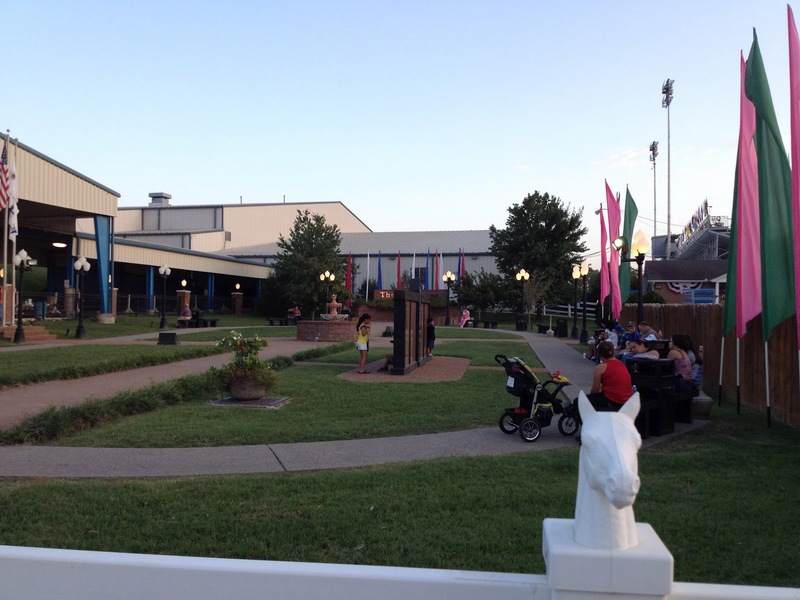 To see the quality of horses and to walk around on the grounds. You can just feel the history of the breed. It's also a very social atmosphere. Most of the seating is box seats. Where six chairs are placed per box. So people are even seated more casually to enjoy the show. There is a program that lists every entry in every class, so you can follow along and even play judge and mark your own cards in the program to see if you agree with the judges. I have typically selected what I thought were the top 3-4 horses and see if I'm at least in the ballpark with what the judges select. I have to say I haven't done too bad...with at least a few of my horse choices winning or in the top few. If you want to really get into it, they post the judges cards on the big screen right at the end of the class. Or you can go online to see the judges card results posted. It's all done almost real time. In addition you can go online and see the photographers photos of the classes. Shane Shiflet is the Celebration photographer...and he posts after each class, so you can either go to his office space to review the photos, or go on the internet. 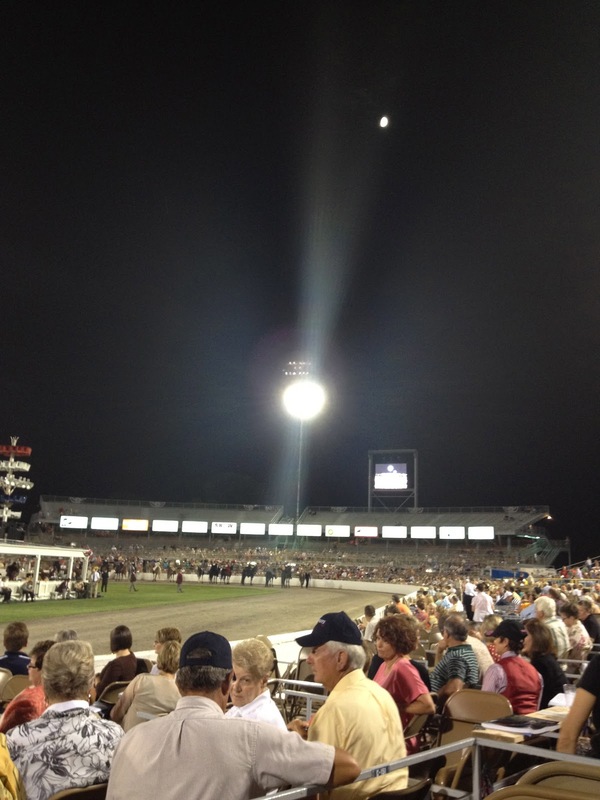 We even went out on our iPhones and Smartphones from our seats in the box to see some one day. Amazing! 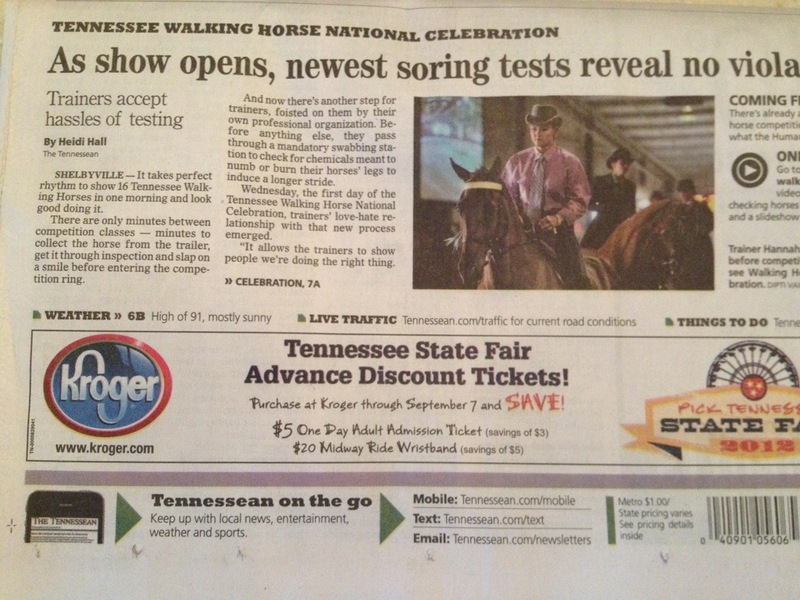 Wow what technology has delivered even to the horse shows. I was able to sit one night right on the wall of the ring in the box in the first row. Literally I could have reached out and touched the horses as they went by. It truly is enough to make your heart pound with excitement. And you had to keep your mouth closed (I know a tough feat for me!) otherwise the dirt could fly right in. However typically you get it in your lap as they round the bend. Lol. Surprisingly, I did not eat dirt. However I did get hit with it more than a few times. All part of the excitement of the first few rows of boxes. Mary, me, Carol & Ester. 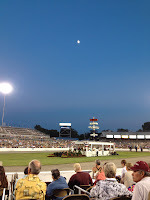 I also sat for a while with Carol Olp and Mary Pickardt in their box, which was right on the bend, up a few rows, where you had an excellent view of the horses in the straight away as well as through the west end of the ring. And met their friends Ester & Jim. We had fun and I met more folks and enjoyed the peach ice cream. Later we moved our way down to sit with Darden and Dr Gladney, which is always a fun and charming time. And of course I met so many new people. Unfortunately Deborah wasn't feeling well, so we only enjoyed her company for a short while one night. 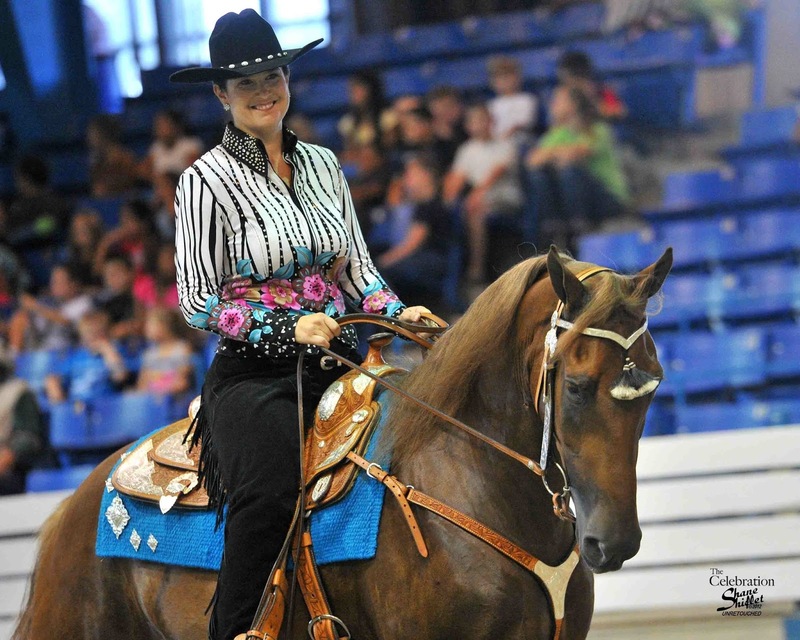 And I met Kathy Zeis who owns Texas Joe Black, and I learned a little about the color chart of our breed. In fact Kathy is the person who put the TWHBEA color chart together. So she is the expert and knows it in detail. She also got up to give an award presentation for the funding efforts for the swabbing testing. They we're able to raise over $180k, and the Irby Baskin Co. matched up to $100k. So a huge fundraising success towards cleaning up the reputation of the breed. In fact on Friday they announced all the first results had zero instances. 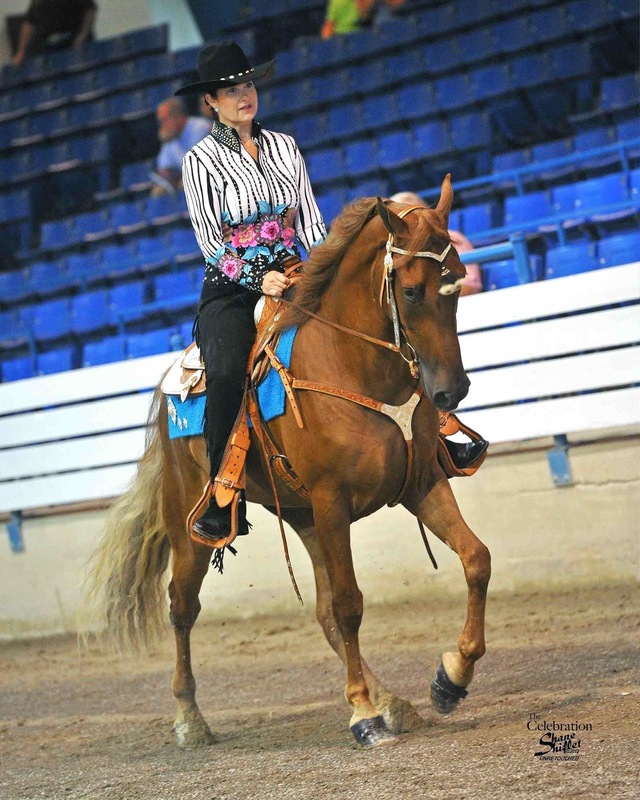 And the poster child in the news paper of clean horses was my very own Bourbon with Hannah riding him in the warm up ring. :). Hannah riding B - as good poster child. Me and Carlan enjoy the show. 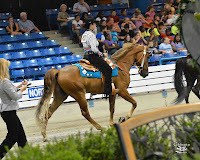 The horses are amazing...and so far I saw the preliminaries for the stake class...and rumor has it our new world champion will more than likely be Copperfield or Walk Time Charlie. 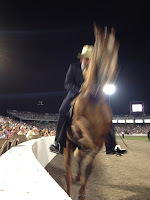 And I saw them both, so even though I won't see the stake class in person next sat night, I have now seen both ride in person, up close from that first row seat. I also saw HONORS, my favorite horse...in the four year old preliminary. All three of these horses won their classes unanimously with all five judges picking them first in their respective classes. So the stake class is surely going to be awesome! They are not sure if Honors will stay in the 4yo WGC stake or go for the big stake this year. If he does, I'm sure these three horses will have quite the showdown. And, all of them being in the same ring at the same time, will take the house down. But rumors are rumors and all part if the anticipation, publicity and fun that makes the Celebration what it is. 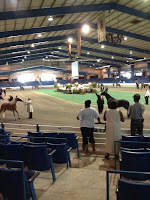 Unfortunately, less than half of the horses registered for the prelim classes made it to the ring. A few big names thus being removed from the stake class. Which isn't good news...especially if they were turned down through the DQP process. curly potatoes to snap this photo! Food is another pastime of the show. 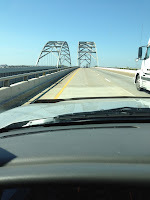 And I've certainly had my share of curley homemade potatoe chips, ice cream, pork tenderloin sandwiches and sweet tea. Its a good thing I'm getting all the exercise with the horses this week or I wouldn't fit my show pants on Monday. Lol. Another activity is walking through the show barns. Most of the trainers set up an area for their customers to lounge, relax, socialize and eat. Hannah had a great mexican fiesta night on saturday night, complete with margaritas from these cool margarita makers. It was all very yummy. Plus I got the chance to chat with her and her other customers. Which is something you would think you'd do a lot more of all the time. But when everyone is showing and nervous, it doesn't always work out that way. So this was a great way to get to know everyone better and spend some time without the horses and showing pressures. And I have to say everyone cleans up really nicely. Lol. to enjoy. We had a great mexican fiesta Sat night. Krista mans the golf cart. 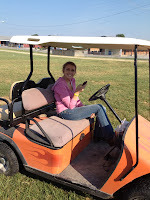 Golf carts are the fashionable mode of transportation around the grounds. Be that from trailer to ring. Or from barn suite to ladies room or car. 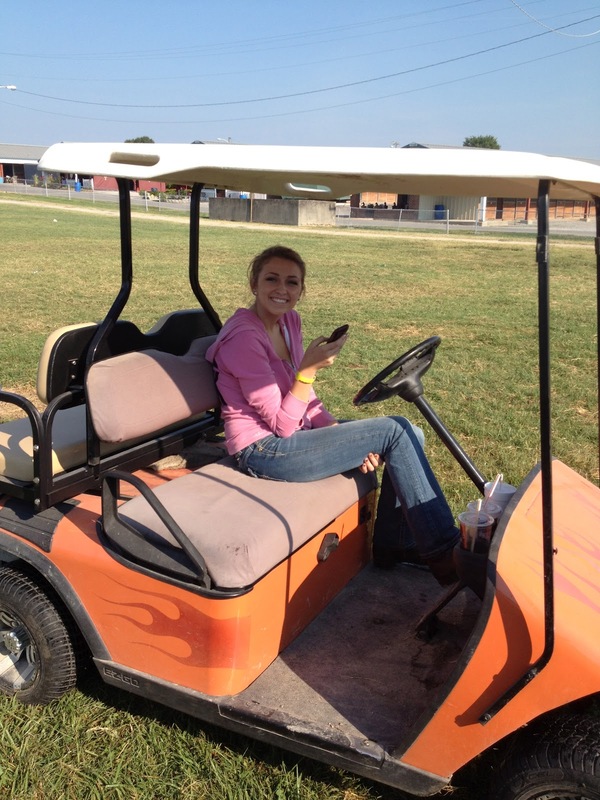 Hannah had her cart on the grounds all week and I appreciated it more than once! I even got to drive a few times. It is quite spectacular - orange with flames. Bub says he has to change the color, all us girls think we should add bling. Bub is outnumbered at the barn by the ladies, so I fear the later just may happen one day, especially if miss Krista bling-lady herself has anything to do about it. Lol. Katie and I enter the stadium. 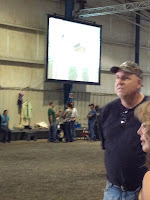 I also stopped by to watch the horse auction. The famous Sale of Champions was directly across from my B&B so I stopped on my way home one day to see the horses sell. It was celebrating its 50th year this year. Not much was put up for sale while I was there. And if I wasn't so paranoid about getting a bad deal, you certainly could pick up a nice trail horse for under $1000....some only went for $200-300. I heard some top mares in foal did bring $5k and more later in the day. 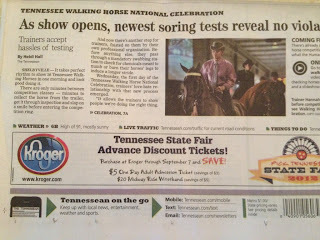 Well that covers some of the weekend activities, which brings me to my last day of showing at the 2012 Celebration. But that'll be my next blog post.... Until then! On Thursday morning I woke early with a nervous stomach and no appetite. But I got up, went down and had a bowl of cereal. I skipped the coffee thinking that caffeine just may take me over the top. My nerves were frazzled enough already knowing that I had two western classes today. A big day! I then hitched a ride with Kevin and Lisa to the grounds. And thank goodness for their kindness, as I had heavy chaps, boots, hat box and my show shirt to carry. I could have done it, but it would have been a balancing act those few blocks and I'm sure I would have worked up a good glisten. Bourbon was being lunged when I arrived and so I watched him for a while. He's getting so big, and really filling out now too. Such a pretty boy! I smiled. 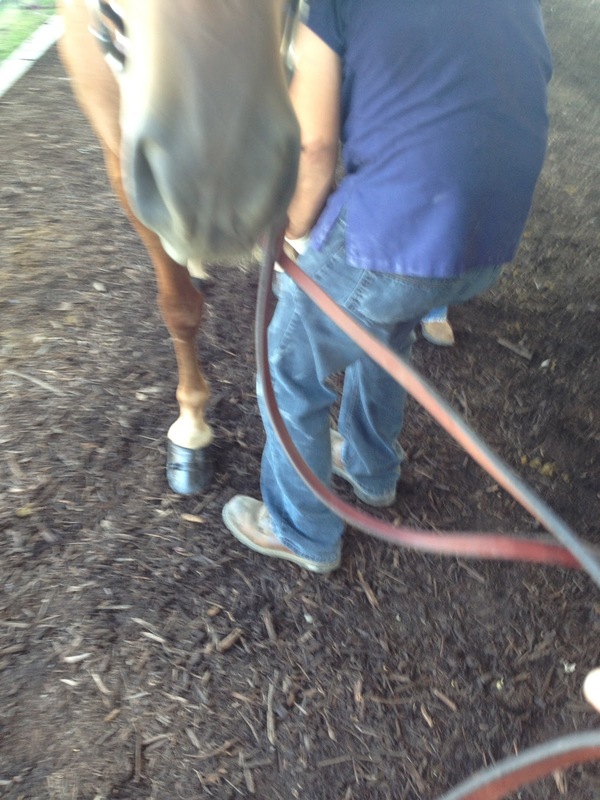 I then set about helping clean up horses, brushing manes and cleaning up hooves to be polished. 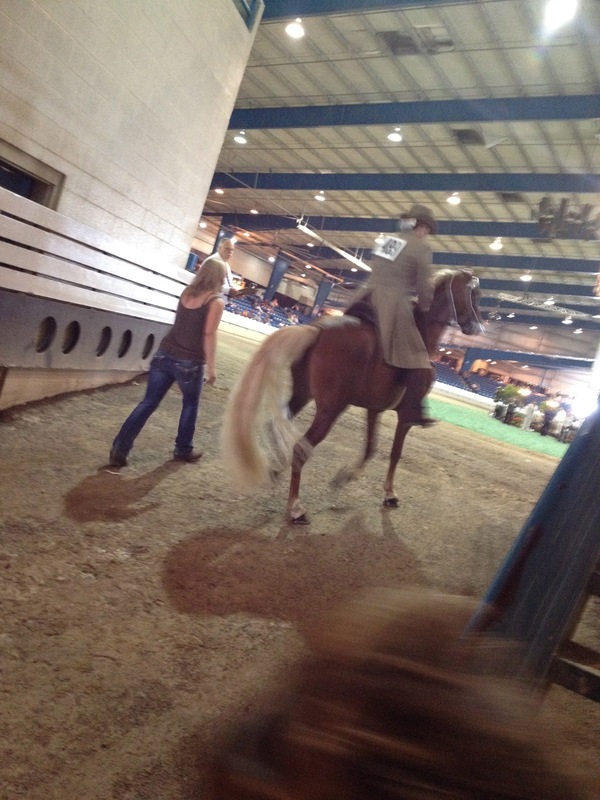 And in short order, we were hustling clothes and tack up to the warmup ring. I jumped into the golf cart with Lisa Weaver and we hauled hat boxes and show shirts into Calsonic. In no time bourbon and Hannah arrived and proceeded through the DQP and he was tacked up immediately. We were in the second class of the morning, so Hannah wanted to warm him up immediately and get me to ride right away too. In no time, the first class was over, and our class was being called. 18 horses were on the call sheet. My ride was much better than the day before. B was fresh, and he was calm. Even the large group of about 2 dozen kids, that were all dressed in red and sitting along the one side cheering loudly, didn't upset him. He heard them, stretched up his neck and turned and ear and eye towards them, but I jiggled his bit and he went right back to the business at hand. Good boy!! Many of my fellow competitors were not as lucky. I saw multiple horses act up, get a little freaked out and was very thankful for such a nice temperament horse in bourbon! The flat walk, running walk, halt, and trail walk were called, we reversed and did it all again. I felt good, and I smiled. Hannah was very complimentary from the sidelines as well. I heard a cheer in one corner that I think was Jane, and another from the other end of the arena, who I'm pretty certain was Bobbikaye, who bred Bourbon. So it was nice to have a few fans in the crowd. Me and B - in western wear! Unfortunately as the ribbons were handed out, I was left with none. Darn. It's always a let down, and you have to do, as I endearingly have called it, 'the ride of shame' out of the arena. At least there were a number of us in that ribbon-less crowd. As I exited there were a number of folks who said they were surprised we hadn't placed. And when I talked to Hannah for feedback on my ride she said she thought I did it perfectly and had shook her head. I had had one trip in front of a few judges that probably saw me, so I just felt bad. Like I had let her down. She has worked so hard on B and this is as much a validation of her hard work as it is a reflection on me and B. 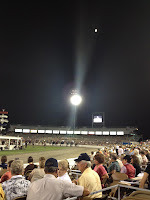 So, I had to shake it off and chalk it up to a great group of talented horses, and set my mind to NOT trip. And see if that helped in the next class. warm-up - to watch the classes. I had about 4 classes between my two classes. So I jumped down and just stood and held Bs reins. He proceeded to lower his head and pathetically ask for attention. I gladly provided it. Basking in the moments with him. He's a total sweetie, and he just stood while I pet his velvety nose, adjusted his forelock and massaged his ears. I have to say this relaxed B is much nicer than gnashing B from yesterday. I'm sure that class workout helped a little as well calm the nerves....in fact for both of us. Too soon they called our next class. This time no tripping. Well, maybe a little one, but not in front of all the judges. He sounded really good, he seemed to be hitting it hard, and he looked to be shaking well too. I loosened a little in the reins. But I also felt myself collect a bit too. I tried to keep that balance between keeping his head set, but loose so he shakes. But not giving him away so he trips. Whoops, like that little trip. I rode him like I stole him. And really before I knew it, we were getting called into the line up. This time when they called the lineup, I was all the way on the other side. So I got to make one of those showboating passes...as the last one on the track coming into the lineup. Pleeeeeease don't trip! Whew, we made it. I lined up in the long curve, with the other 26 on the call sheet. When the winner was called it was one of the horses that had been winning the trail classes. Line item veto. A small bay who was a shaky cute thing. Followed by Juan Carlos, who is another bay. And honestly, the two of them could be bookends they are so similar. My only thought was, well those are a far cry from B, my big red Clifford, Cadillac style horse. So well see how this plays out, but T this point my confidence, or maybe more precisely, my hope for getting a ribbon is wavering. But I was not overlooked this time, in this huge class I was tied 8th. I simply beamed my way to get my brown ribbon. 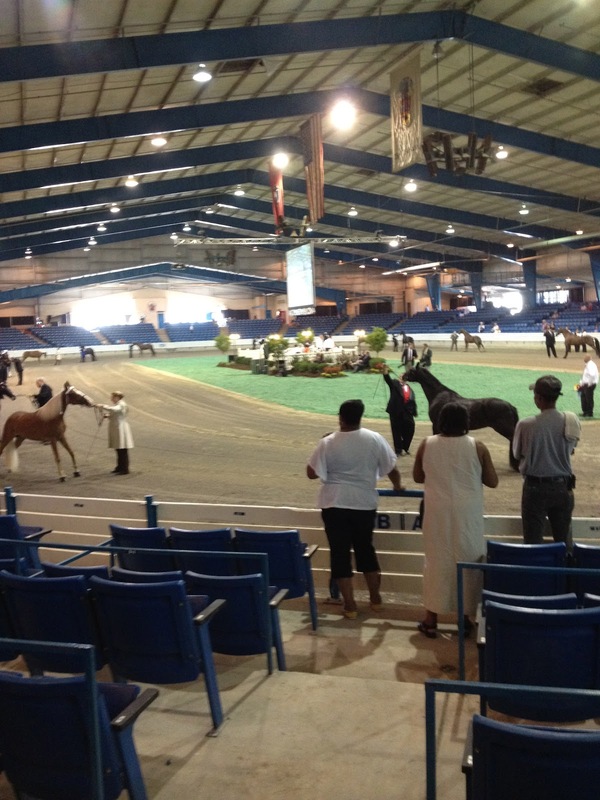 Any ribbon at the Celebration is an honor, as this is basically the Super Bowl of the walking horse shows. And the horses have been exceptional. So I will take that brown ribbon with pride of accomplishment. 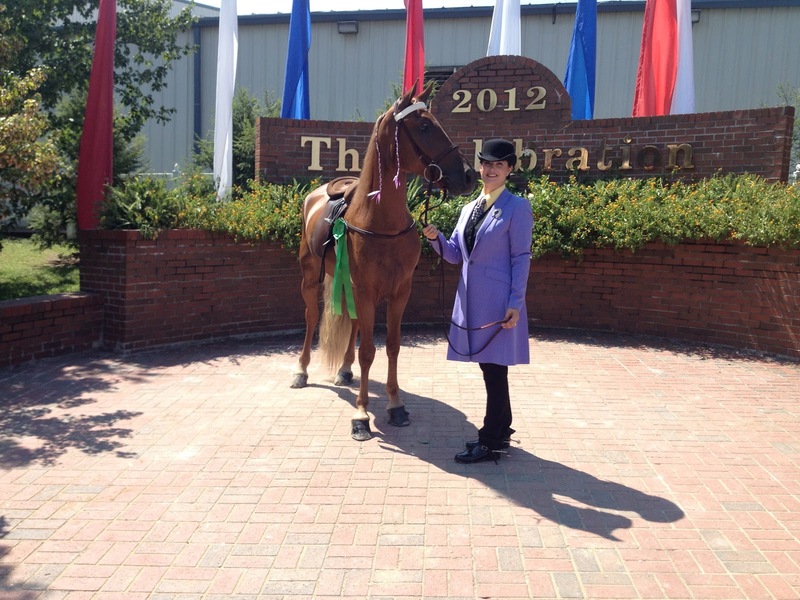 I hope Hannah feels the same way, she has done so much with B....and now we have earned two celebration ribbons. I know officially people only acknowledge the winners and reserves in a formal way. But if I am tied, it is huge at this point for me. At least I'm doing it...trying it...putting myself out there to succeed or fail. I think this is success. With room to work even harder and improve. Lol. All smiles collecting my ribbon! The rest of the morning I helped with the Pulvers gang, and then went out to lunch with Carlan and her father. He drove six hours to watch her show Lil Wayne for a few days. And got to see her win a reserve and third so far while here. We went to Millers, which is a cute local place in Christiana that serves up home cooked meals and pies and cakes for dessert. I had never heard of it before, but krista had wanted to have dinner here earlier but they only did dinners on the weekends. Ironically when the three of us walked in, krista, her dad and sister were there! We had a laugh about that, cuz she was threatening to bring me here herself. Couldn't believe I had never been here. And also seated right beside our table were all the judges from the celebration. I guess they were on break between the morning and evening class sessions and enjoying a good meal. I guess they tied this restaurant like they tied my horse today. So the meal should be good. Lol. WC and WGC winners go for media photos and celebration. My afternoon was then spent working. (I'll continue to leave that to your imagination.). Later in the evening I took a walk over to the Celebration grounds to see how the performance classes were doing. 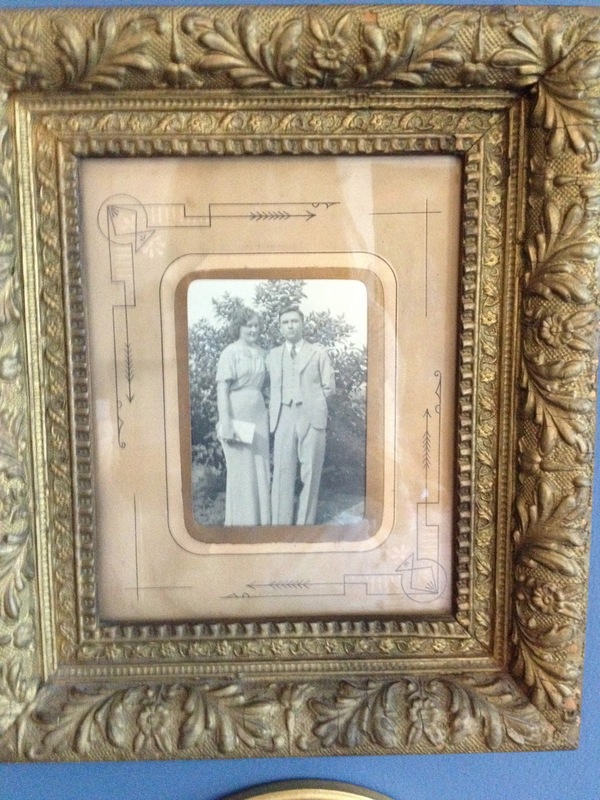 I bumped into Anne frank and Sheryl Volkman, and we chatted a little while. 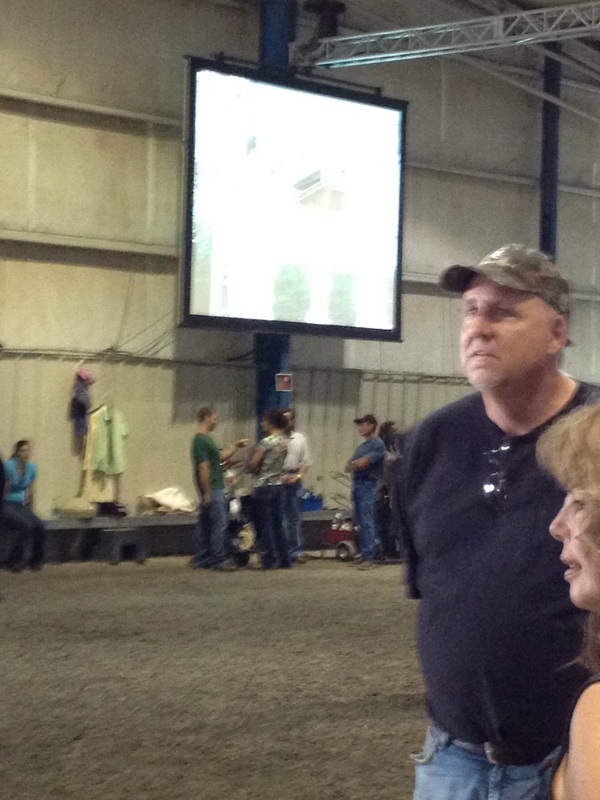 I then walked by to see Hannah's stables customer suite that she had set up for all of us. She had it beautifully decorated with a big couch and horse photos and landscaping. Very cozy and feminine I thought. I hadn't even been here to see it the first few days of the show, and from the look of it, I don't think any of us have. But she is planning a big party over the weekend, so I'm such it will be filled with laughter and fun soon. I then went inside, grabbed dinner and sat and watched a few classes. I soon left and walked back to my B&B. Alone isn't fun, and I miss Jane I mussed. But tomorrow is Friday. I plan to work most of the day, but then it's the weekend and well all be together at the show. Besides I just realized how tired I was. And so bed all of a sudden sounded good. I hope I get to dream of my ride all night. Calsonic is a pretty cool ride! Good night. The 2012 Celebration has arrived! And since I can't contain myself, I'll jump right to the punchline....Day # 1 delivers our very first Celebration ribbon! 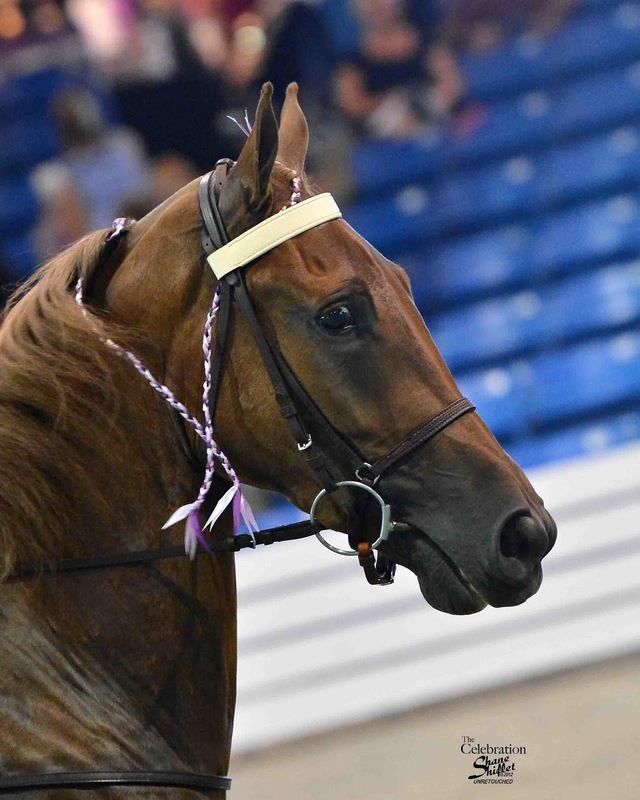 A fifth place in the 3yo Trail Pleasure English class. Yippee! So, Monday and Tuesday are practice and prep days, and of course horsey SHOPPING. And, I've been weaving in half days of work, but I'm going to leave those details to your imagination. This week I am staying at a little B&B that is literally one block down from the Celebration grounds. I lucked out on a room and while I miss Jane and our fun camaraderie, it is only 3 minutes from Hannah's and B, and a few minutes walk to the show. Plus, there are other guests here for the show as well....so I have been enjoying morning breakfast along with horsey conversation each day. Lisa and Kevin are from NC and have a park horse with a trainer named Patrick Thomas...and they got a blue today in fact. So, excitement of WC (world champion) titles here at the B&B as well. 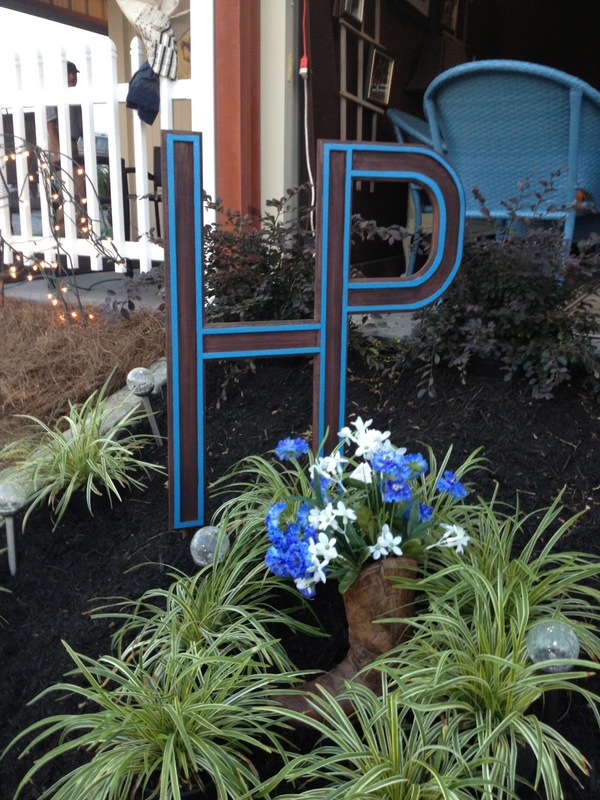 Another fun fact is that the proprietor of the inn has walking horse history. 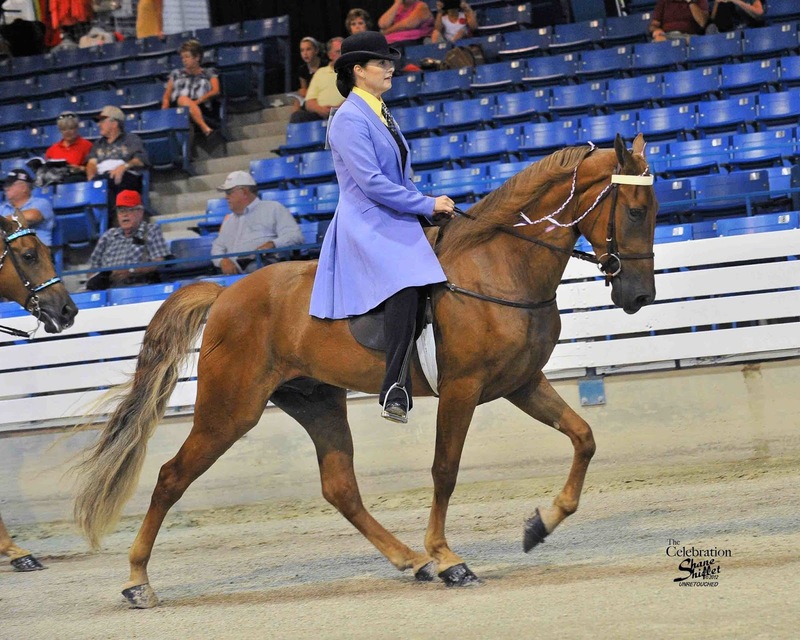 Her father was the man who bred his mare to Wilson's Allen to bring us Strolling Jim, the very first world grand Champion horse at the very first Celebration. 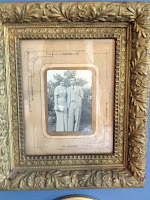 A photo of her father and mother hangs in the guest room I occupy. Which is very cool. This too could be a lucky charm for me. That basically brings us today. I woke at 630am for breakfast at 7am. And shortly after 8am was hiking down the lane to The Celebration grounds. Conveniently Hannah's trailers were all parked in the grassy area right in the corner closest to my B&B. 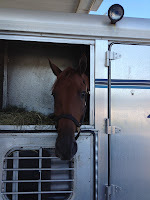 And there was Bourbon, tied to the trailer and enjoying his bag-o-breakfast hay amoung the 19 other horses from Hannah's barn that would compete today. Yep, I said 19, umm, and thats only today! 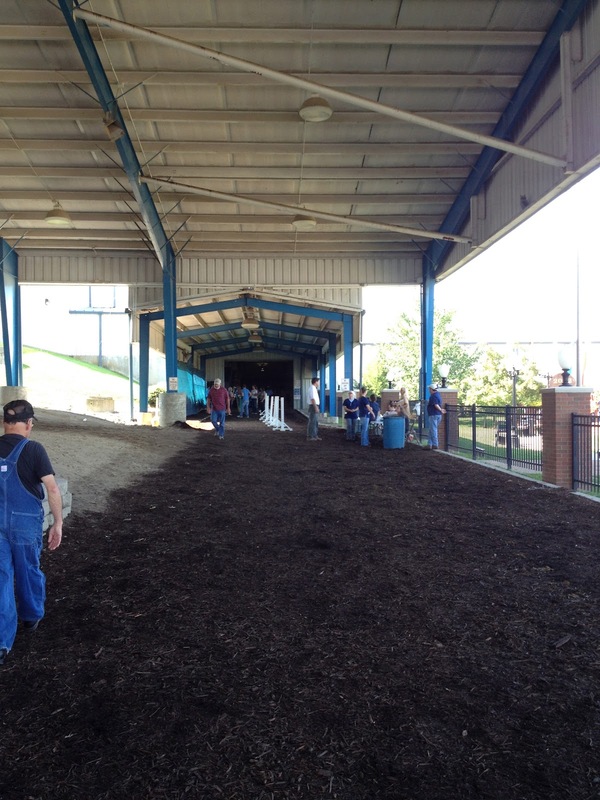 I helped hold a few horses to be hoof polished and then walked into the Calsonic arena to catch a few of the first classes of the day. Unfortunately, as those close to the walking horse industry know, there is poor publicity surrounding the breed, and so the place was occupied by the media. 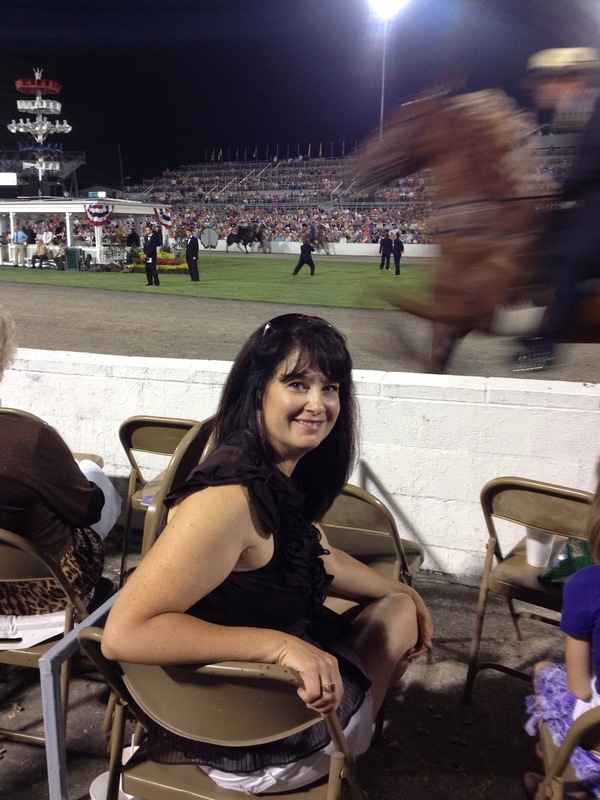 In fact, when I was watching the first model class a woman came up to me and was asking about the class and if other riding would take place, etc. I came to find out quickly that she was from the media. In addition, a few photographers were seated in my section who were taking photos inside the arena as well. I think they weren't finding much "dirt" today, since it was all pleasure classes, which are less susceptible to the controversies of the moment. Anyways, I went back to the trailer to collect B about class number 7 and proceeded to take him through DQP, the checkpoint. But what's this? A swab station? As I entered the walkway up to the DQP, everyone was being stopped and a team approached with a Q-tip and swabbed it on both of Bourbon's feet, and sealed it in a tube that they made me verify was marked correctly. All very CSI forensic like. Interesting. The test is used to uncover any agent that shouldn't be used, aka for bad reasons. I'm confident Bourbon will 'pass', but the rumors say that even fly spray or other common horse related products can test against you. So, obviously everyone is a bit paranoid. The result of a failed test is loss of your ribbons, fines and other penalties from showing. Very serious consequences. Next, it's on to the DQP checkpoint where they have you walk the horse in a figure 8 around cones and hoof test and palptate the feet. Again looking for signs of abusive training methods. Of course we pass. So, with a green thumbs up we are into the warmup ring to tack up and warm up before my class. 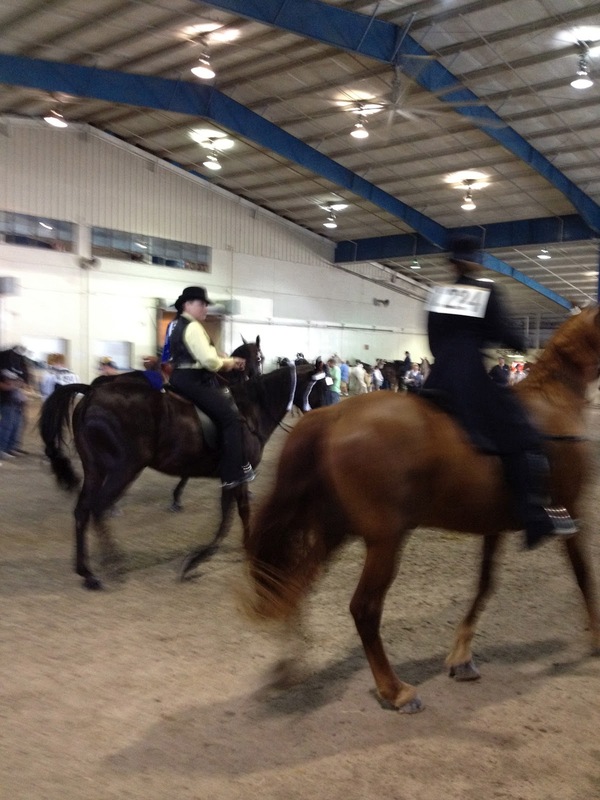 Dozens of trainers are dotted around the warmup area, and dozens more horse and riders are in the middle riding. It's mass chaos at it's finest. I watch Hannah warmup B and then climb aboard myself to test run him through his gaits. I hated this tiny, chaotic warmup pen last year and once again I will confirm that opinion this year. The next 30-45 minutes are filled with warmup ring loathing, standing around, and waiting. Even B was fed up with it all and decided he'd try to chew his way out, starting with the bit in his mouth. Oh please call our class soon before he succeeds at his little knashing task. Yeah! Finally they call class 11, the 3 yo trail pleasure English class. The ramp into the ring. wins a WC on Sky in this class. 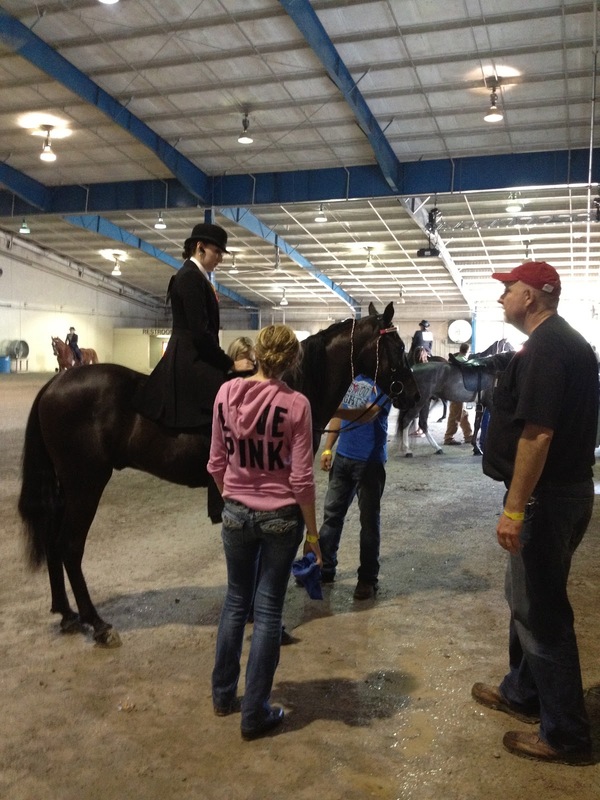 Hannah had ridden her lite shod horse in the class prior, and had won! So literally she exited from her victory lap, handed off her horse, and ran to the entry gate so she could shuffle her clients, including me, into my class. I don't think she blinked twice about it, and that victory lap was her very first WC ride she ever had personally. What a shame she couldn't have reveled in that moment longer. But, she is unbelievably dedicated and of course this is all the territory of her job. So, one by one she waved us up the famous ramp that you go up as you enter the ring. I was about the fifth or sixth horse into the ring of about 15 entries in my class. So up, up and in I went, with a few last sage words of advice from Hannah. B was ready to roll, maybe a bit too ready. But I squeezed the rein a bit to adjust his speed and we made a great entry pass for the judges. And once everyone was in we took the rail and the flat walk was called. 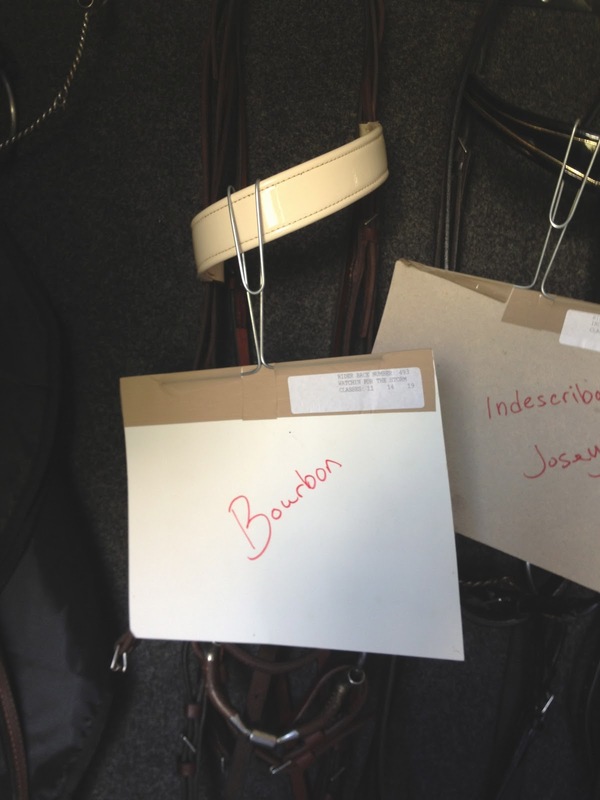 I was lucky to set myself up well away from other horses to give the judges an uncrowded view of Bourbon. And our first way of the ring went well, except for some head shaking by B. He must still be a bit perturbed from the long pre-class detainment, I thought. Or was it water in his ears....his mane tickling him or 3yo fidget fit? Not really wanting to truly learn the answer, I went about the class keeping him in rhythm at a perfect tempo with his hooves. The reverse was called which restarted the work of me getting my little fidget meister under control and then we were called into the line up in the East curve. Whew. He was a handful today. But he sounded good and I felt in sync with his stride and shake. So now the long wait to find out what the judges thought. And as the starting statement of this blog entry professed, we got fifth, a pink ribbon, our first ever ribbon at the Celebration! Way better than our non-placement of last year. Yippee. And he made EVERY judges card, including two 4th place ties from 2 of the 5 judges. Double yippee!